The first decade of the millennium saw significant growth for transit in America. From 2000 to 2010, the number of regions with fixed-guideway transit — rail systems or bus systems with dedicated lanes — grew from 27 to 40. And ridership followed. In the period beginning in 1995 and ending in 2008, total American transit ridership grew 36 percent — or three times the rate of population growth. A new report from the Federal Transit Administration and the Center for Transit-Oriented Development [PDF] takes a closer look at population changes and travel behavior in transit-accessible America. Some interesting patterns emerge. During the aughts, 881 new stations were built across the United States for rail transit or high-quality bus transit, and the number of people living within a half mile of a transit station grew 6 percent. However, overall population increased nearly 10 percent over same time. The number of households near transit has grown faster than the population near transit: up 8 percent over the same period. That’s because, in many cities, transit-accessible neighborhoods were especially attractive to smaller one- and two-person households. Over that decade, three-person households in “transit zones” actually decreased by 8 percent. The shift to smaller households near transit was especially pronounced in cities with extensive systems like New York City and Boston. In these cities, the areas around transit were generally already densely developed. As a result, most of the national population growth around transit occurred in cities with smaller transit systems, where housing units per acre near transit increased as much as 23 percent. By 2010, people living within a half mile of transit accounted for 11 percent of the population in the 40 metro regions examined in the study, for a total of about 16.6 million people. About 75 percent of those people are concentrated in five cities: New York, Chicago, Philadelphia, San Francisco, and Boston. Still, in some other regions, including Washington, DC, and Portland, more than 10 percent of the population lives within a half-mile of transit. It’s unsurprising but notable nonetheless that people who live within walking distance of transit — a half mile radius, for the purposes of the study — are significantly more likely to take transit or walk or bike to work than people who live farther away. In several regions, the share of people who get to work without a car is twice as high inside the “transit shed” compared to the region as a whole. But only in cities with the largest transit systems, did rates of active commuting increase over the decade. On average, households in transit zones also owned .5 fewer cars than their neighbors outside the transit shed. In cities with smaller transit systems — Portland, Salt Lake City, Buffalo — average car ownership differences were less pronounced. Households in these cities’ transit zones owned .25 to .5 fewer cars on average than others in the metro region. From 2000 to 2010, combined housing and transportation costs as a percent of income rose in most transit-accessible neighborhoods — but not as much as in the regions as a whole, the authors report. In an era of rising gas prices, transit was especially beneficial for households looking to spend less on transportation. 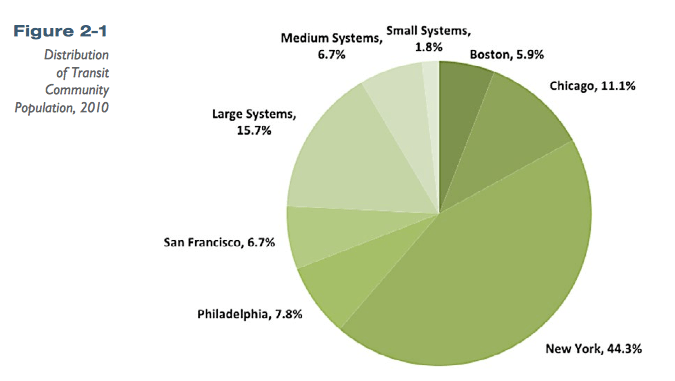 I’m surprised they don’t consider Washington D.C.’s transit system to be within the largest (“extensive”) category. Is this supposed to be a success story? If you look at these numbers and think about the amount of money that has been spent on transit, it’s actually pretty depressing. Since 2000, the Atlanta region has grown by more than 1.5 million people, or over 25 percent, but transit service is not keeping up. Both rail and bus ridership on MARTA, the major regional transit provider, have fallen dramatically in recent years.